These lines from Robert Frost’s poem, Mending Wall, have stuck with me since my undergraduate final thesis project, growing increasingly haunting the more I’ve become interested in the role the built environment plays within contested places (where too often this question seems to be ignored). Back when I took inspiration from those words in my work, I was designing a hotel within the walls of a Scottish castle and thinking about defense and security and time and nature – walling within and walling outwith. Whoops, Sir Ian! They’ve now been standing for longer than the Berlin wall did, and in places taller. And the sad reality is that once these walls have been there as long as they have, it becomes very difficult to take them down. A recent study by researchers at the University of Ulster shows that the almost half of the people who live next to the walls would like them to be taken down in theory, although only 11% feel ready for that to happen now. I can well imagine that if you’ve grown up your entire life next to walls like that, you’re going to think there’s a pretty huge and scary monster on the other side if it requires a wall that big to keep it out…and it understandably takes time to shift that mindset. 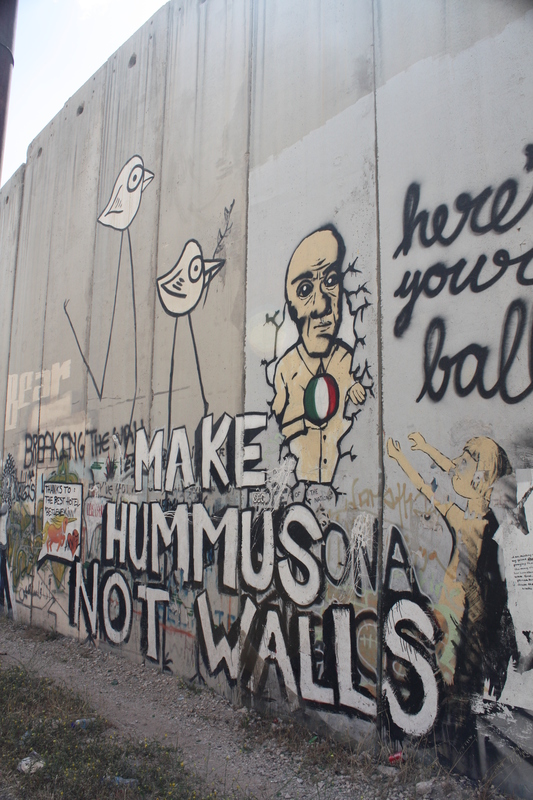 And so with this in mind it is deeply upsetting to see the way in which the Separation Wall has been thrown up in the West Bank over the last ten years. I won’t get into its position, well across the green line into Palestinian Territory, constituting what many have referred to as a ‘land grab’. 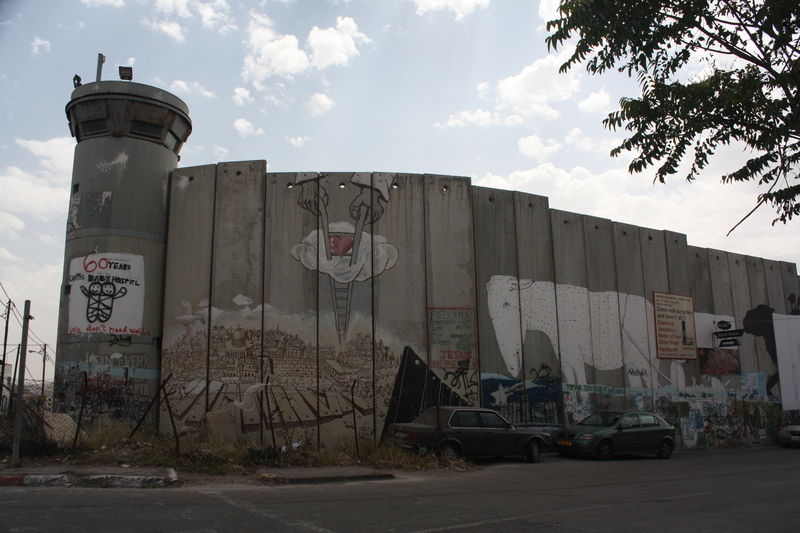 Returning to Frost’s question of what it is walling in or walling out, the answer is not so much Palestinians from Israelis as might be the logical assumption, but much more frequently Palestinians from other Palestinians, and from their land, schools, jobs and towns. And it scares me, because I know these walls don’t come down too quickly or easily. It doesn’t help that Israeli statistics showing a decrease in suicide bombing incidents by 90% in the last ten years attribute this entirely to the wall. This creates a sense of dependency on the wall – if you think you need it for your safety, you obviously won’t want to see it come down any time soon. Oh, and by the way, they call it a fence, not a wall. But it looks like a pretty bona fide wall to me. 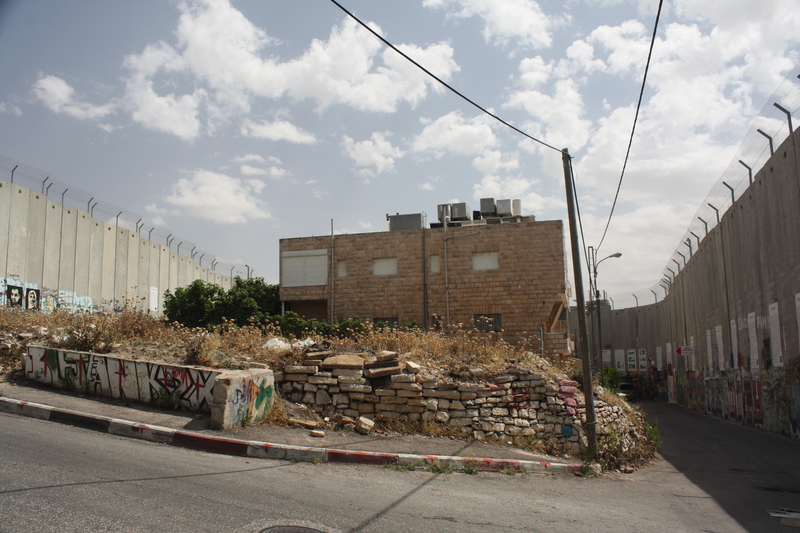 I walked through a checkpoint for the first time the other day on my way to Bethlehem, instead of taking a bus, and I must say it was a pretty grim and oppressive experience that no amount of colourful wall art graffiti on the other side could soften, as much as it did make me feel almost like I was right back in Belfast at times. 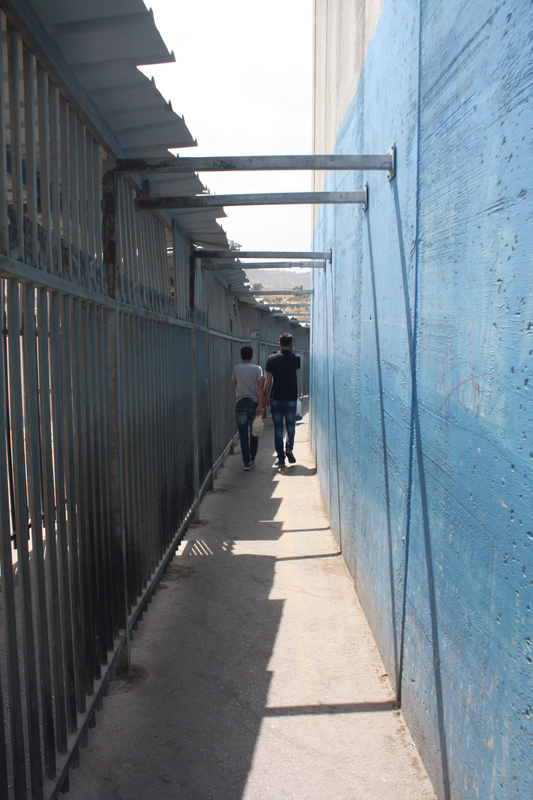 Walking along the wall to pass through the checkpoint. This building is surrounded by the serpentine wall on three sides. For what it’s worth, I don’t love this wall, I want it down! For the quote by Sir Freeland: Harding, Thomas (25 February 2004). “The Security Wall on our Doorstep” The Daily Telegraph. Byrne J, Gormley Heenan C, Robinson G. (June 2002). ‘Attitudes to Peace Walls Research Report to Office of First Minister and Deputy First Minister’ University of Ulster. Robert Frost’s poem, Mending Wall, was written in 1914 and can be read in full here.